A woman smokes an electronic cigarette at a store in Miami. But that lack of certainty means that people need more protection, not less, according to a report released Tuesday by the World Health Organization. The global health organization called for a ban on indoor use of e-cigarettes in workplaces, restaurants and other public spaces. 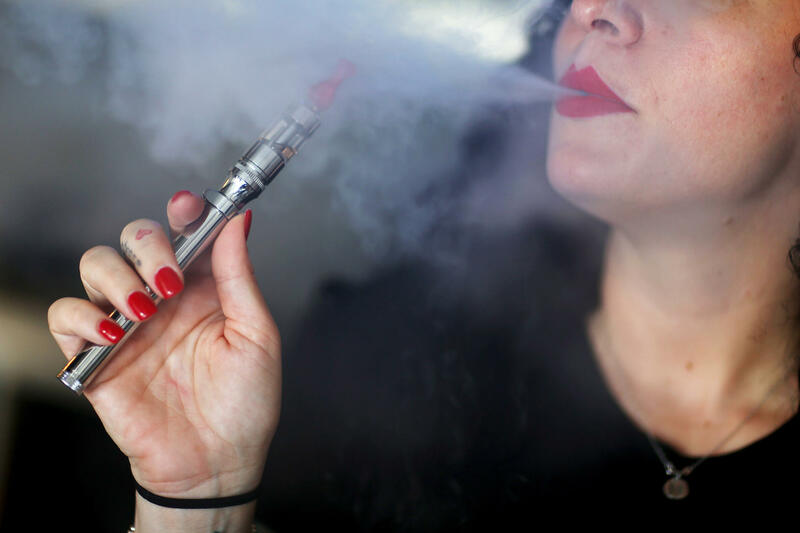 The vapors "pose a serious health threat to adolescents and fetuses," the report says, "and increase exposure of nonsmokers and bystanders to nicotine and a number of toxicants." Some studies have found that bystanders absorb more nicotine from vapor than from tobacco smoke, the report says. One of the biggest selling points for e-cigarettes — that they can help people quit tobacco — hasn't been systematically tested, the WHO report finds. E-cigarettes are probably less toxic for smokers who switch completely, the report says. "The amount of risk reduction, however, is presently unknown." Advertising of e-cigarettes should be banned, the report says, to reduce the risk to children and teenagers. The liquid used in the devices is often candy flavored. And e-cigarettes don't necessarily deter young people from smoking tobacco, according to a study from the Centers for Disease Control and Prevention published Monday. Earlier studies have found a modest deterrent effect. But this study found that 44 percent of those who used e-cigarettes say they plan to try tobacco cigarettes in the next year, compared with 22 percent of those who haven't tried e-cigs. The number of teenagers who had never smoked a cigarette but used electronic cigarettes more than tripled in three years, the study found, rising from 79,000 in 2011 to more than 263,000 in 2013. The results were published in Nicotine and Tobacco Research. And if that's not enough, the American Heart Association issued its first policy statement on e-cigarettes, saying that the devices should be regulated like tobacco products by state and local governments, including them in smoke-free laws and taxing them to discourage use by teenagers. In April, the Food and Drug Administration issued proposed regulations for e-cigarettes, but final rules are the focus of intense lobbying by tobacco control advocates and the tobacco industry. Both the WHO and AHA reports voiced fears that rather than help get rid of tobacco forever, e-cigarettes could make smoking culturally acceptable once again. The reports were issued in advance of a global health meeting in Moscow in October, where regulation of e-cigarettes will be debated.